PRESIDENTIAL BUDGETS are odd things. They are a list of priorities briefly incarnated in numerical form, dissected for a day and then summarily discarded by Congress, which goes on to pass the budget it always intended to. The exercise is one of showmanship. President Donald Trump is certainly not a man who busies himself with details; he understands the importance of signalling. 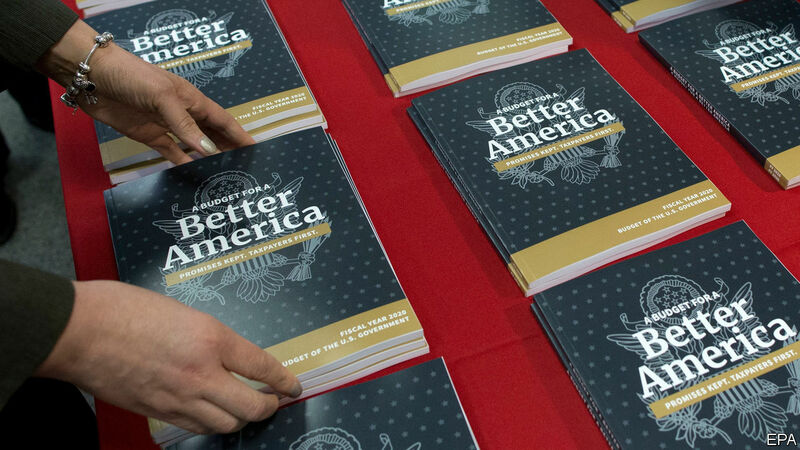 His proposed budget for the 2020 fiscal year, released on March 11th, signals a few things. He has dropped the Republican pretence of caring about deficits altogether, he still wishes to slash the budgets for regulatory agencies and safety-net programmes, and he is clamouring for another fight over his border wall. In his $4.75trn plan, the president urges that “we must protect future generations from Washington’s habitual deficit spending” and warns of the dangers of high debt loads. Yet the budget also projects trillion-dollar deficits continuing through 2022, largely due to the tax cuts enacted in 2017. For the current fiscal year, which ends on September 30th, the White House projects a deficit of $1.1trn, or 5.1% of GDP—a large amount given that America is not fighting a major war and its economy remains in rude health. Eventually, the budget would balance in 2034—but only on the assumption that the economy would continue to grow at more than 3% a year in real terms. A polite word for that projection is rosy. Calls for fiscal discipline from Republicans have always been loudest when the party is out of power. But in presenting a budget that shows sizable, decade-long deficits to barely audible criticism, Mr Trump has demonstrated that he has yet again bent the Republican Party to his will. The approach to eventually balancing out the deficit in 2034 follows a more orthodox, Reaganesque trajectory. Mr Trump proposes starving some regulatory agencies while beefing up military spending. Although he proposes increasing defence spending by 5% to $750bn—more than was requested by the agency—he suggests a 10% cut to the education department, a 12% cut to the housing department, and a 31% cut for the Environmental Protection Agency (EPA). The administration would like to pare back Medicaid, the government health-insurance programme for the very poor, to the bone by eliminating the expansion of the programme made under the Affordable Care Act and cutting $1.5trn in spending over a decade. Food stamps and cash welfare would see hefty cuts if the president got his way. The plan also calls for significantly less spending on Medicare, the health-insurance programme for the elderly, by rooting out “waste, fraud and abuse”. That is a departure from Mr Trump’s campaign pledges to avoid cutting Medicare or Social Security, which disburses retirement and disability benefits. Even when Republicans controlled Congress, the president’s budget largely went ignored. Now that Democrats control the House, the chances of implementation are non-existent. Mr Trump’s last budgetary battle with congressional Democrats—over securing funding for his wall on the southern border—ended bruisingly. He had to relent and end a month-long government shutdown. Mr Trump cobbled together funds by declaring a questionable national emergency, tapping into various pots of money like one for military construction. Cheekily, he has now asked that they be replenished—along with another appeal for $5bn in construction funds. That cash will never actually materialise, but asking for it does augur another two years of wall politicking.